HOW CAN WOW HELP YOUR COMPANY? Wired or Wireless, Inc. has a qualified team of professionals ready to provide state of the art solutions for your business needs. WOW focuses on creating cost effective and reliable solutions that work with your existing network or can create new network solutions. business network needs at 509-892-5877. WOW provides LAN (Local Area Network) and WAN (Wide Area Network) design, integration, upgrades, migration, relocation and support services. Our LAN/WAN design services include desktop integration, wireless device integration, network security and firewall, IP telephony, voicemail and email messaging. Our network designers may consider network infrastructure and cabling, telephony equipment, document imaging and archiving solutions and provide document procurement services. 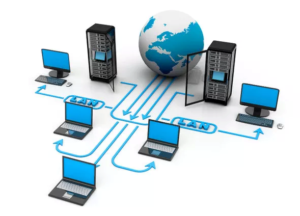 If your business needs a secure connection to run business critical applications in offices located in different areas of the region, or the country, WOW has the network design and integration services to resolve your LAN/WAN problems. Whether installing a high-speed wireless connection to your new building across the road, or a 100MB connection to the server to keep those power users productive, we will install, maintain and support a reliable network to specifically help your company achieve its technology and business objectives. WOW is a premier partner with Carbonite for a secure cloud based business back-up system. The solutions and costs can be scaled to a small or large business. For both onsite and offsite employees. Carbonite now protects data for more than 1.5 million customers, securing over 700 Billion files worldwide. WOW can integrate the carbonite back-up system into your network and other WOW services. Cybersecurity is a serious issue for any business. It’s not a matter of if their will be an attempted breach of your network but when. We will help you plan and safeguard, your business and sensitive data. WOW can help protect your network and provide end-user training through their partnership with Stronger International, Inc. a local Cybersecurity training and consulting firm. Fiber optic communications are different from any other data transmission method, in that it does not use electricity to transmit information. Fiber provides much faster data transfer speeds when compared to traditional interconnection media such as copper wire, coaxial cable or wireless. Fiber optics can support voice, video, and data all at once over a single line.We offer a variety of fiber optic cabling solutions: indoor, outdoor, loose tube, tight buffered. Do you require a high speed backbone or point to point installations within a building complex? Would you like to run fiber to the desktop? Let our professionals guide you through your fiber optic cable installation. We pride ourselves on efficient, high quality, cost effective fiber optic cabling installations. Wired or Wireless, Inc. can not only meet customer requirements but can also participate in the design and specifications of a new system. From design to implementation and from data centers to IP Voice, Wired or Wireless, Inc. is the answer for your infrastructure. Call today for more information or to schedule a solution assessment with our team. IT operations are a crucial aspect of most organizational operations. One of the main concerns is business continuity; companies rely on their information systems to run their operations. If a system becomes unavailable, company operations may be impaired or stopped completely. It is necessary to provide a reliable infrastructure for IT operations, in order to minimize any chance of disruption. Many company use the cloud for backup but other companies still choose a physical data center. Information security and cybersecurity are very important parts of any business strategy. A data center can offer a secure environment which minimizes the chances of a security breach. A data center must therefore keep high standards for assuring the integrity and functionality of its hosted computer environment. WOW can create a solution that is NIST 800 -171 compliant for any business that works with military or government. Whether your next project is incorporating a new Data Center, restructuring your phone systems, installing a high-tech conference boardroom, or integrating a surveillance system, Wired or Wireless is qualified to manage and implement your project. WOW uses industry best practices and decades of experience to provide excellent solutions and service. Each phase has specific documentation, deliverables, milestones and triggers that keep the project moving forward in the allotted time. This allows us to work closely with our clients and vendors to move together through any life cycle. At all times, all parties involved in the project will know the phase we are involved in and what will be needed to complete the phase efficiently. With a highly skilled and qualified team of professionals, Wired or Wireless is geared for planning, organizing and managing resources to bring about the successful completion of your specific network infrastructure goals and objectives. It has become commonplace to utilize video security in all aspects of everyday life. From preventing burglary and employee theft to simply making sure your kids are safe, there are surveillance solutions to fit every need. With the prominence and availability of high-speed internet connectivity, remote monitoring, and playback of video CCTV has become affordable and reliable from anywhere in the world. The WOW team excels in the design and installation of CCTV (Closed Circuit Television) systems, ensuring that you are supplied with a secure, high quality solution for a minimum cost. As the name implies, CCTV (Closed Circuit Television) is a system in which the circuit is closed and all the elements are directly connected. The scope for applications is almost unlimited. Creating the right infrastructure and systems will help your employees and facilities be more efficient and up-to-date. Let WOW help your business use the latest audio-visual technology and integrate it with your other systems. We can combine both hardwired applications and wireless applications depending on the needs and usage requirements. Wired or Wireless has the capability of installing premium audio/video systems quickly. Business telephone systems can be run through a VoIP system – over the Internet network. This can save a business up to 40% of their phone costs. Let us walk you through the possibilities and the savings you could realize. Wired or Wireless, Inc. is able to provide complete Audio/Video and telephone solutions for your business that are fully integrated into your IT environment. If you want to purchase a new communications system(s) and you want it designed, installed and serviced, or if you are a contractor and you need a price quote for a project, call today. We look forward to the opportunity to work with you. A structured cabling system provides a platform upon which an overall information system strategy is built. We design and build flexible cabling infrastructures – structured cabling systems that support multiple voice, data, video and multimedia systems regardless of their manufacturer. WOW can provide the “one stop shop" expertise for all your network infrastructure needs. We will help you evaluate, design and install the optimum integrated system for your company. Independently verified screened and unscreened data communication structured cabling solutions, providing ultimate performance and reliability for today’s and tomorrows copper infrastructure requirements. Our Cat 5 (Cat 5e) or Cat 6 solutions will exceed TIA Cat 5e standards. Conventional cabling solutions that compliment the deployment of optical solutions deeper into the network delivering a future-proof infrastructure. Copper and fiber solutions for diverse and environmentally demanding applications that typically require adherence to strict performance criteria. Solutions that include music and paging systems, CCTV and security systems, fire alarms and access control systems. We employ full-time BICSI Registered Communication Distribution Designers (RCDDs) to assist and optimize your company network design. Consistency – Same cables exist everywhere in the building. Support of multi-vendor equipment – You can mix and match vendors. Simplifies moves adds and changes – As your company grows and/or moves locations with structured cabling your network resources are always ready to go. Simplifies troubleshooting – Wired structuring systems problems are easier to isolate and fix. Support of future applications – A Cat 5 or even Cat 6 compliant system will support future applications with little (if any) system upgrades.